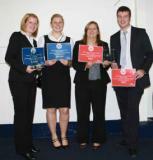 Don't miss three new NFYFC tenancy training opportunities on 12, 19 and 28 January 2011. If you want to boost your business skills, plan to apply for a farm tenancy, or are thinking of entering NFYFC's farm business development competition, then put these dates in your diary and book your place now. Check out the dates and venues for 2011's training events in the agriculture and rural affairs section of the website. Book your place on the first of six new bar tending training courses offered by NFYFC in partnership with drinks giant Diageo. The course is designed to help ensure YFC events are safe, profitable and fun for all, and covers things such as stocking your bar properly; successful service; making cocktails and mocktails; and learning about the laws governing running a bar, including applying for a temporary events notice (TEN). The first training is on 6 December 2010, from 5pm-9pm, at Campanile Hotel, Northampton. It is free and aimed at YFC members staff and associates over 18 who manage and run bars for events or who would like to do so in future. To book a place complete the attached booking form and return it to NFYFC training officer Jo Bouchard, who can also help with futher information about the training. NFYFC reserves the right to charge £20 to those who book onto the course but don’t attend on the day. The National final of the NFYFC Rural Apprentice competition was held in Stoneleigh, Warwickshire, last month and Sue Ryder Care benefited by more than £15,000. The competition, sponsored by Foresters, was launched last November and more than 20 clubs have been competing against each other in an entrepreneurial challenge to raise funds for Sue Ryder. Sue Ryder fundraiser Lucy Barbour was amongst the judges playing the part of BBC ‘s The Apprentice’s Lord Alan Sugar by listening to the team’s presentations and then grilling the competitors who had qualified through to the national final. The judges placed Sophie Ogden and David Johnson from Worth Valley YFC, in West Yorkshire, first. They had involved the whole club in their efforts which had raised an impressive £3,300. Ideas the club had implemented had ranged from a competition to guess the name of the lamb and staging a professional wrestling show. Silsden with Skipton YFC, from North Yorkshire, was runner up having raised a pig and then served it as a hog roast at a local wedding as one of a number of innovative ideas to raise funds. Jeannie Payne, Foresters regional membership manager, said: "Foresters helps communities by raising funds and volunteering for charities and local projects, so this initiative with YFC was an ideal fit. The results were excellent and we are pleased to be supporting the scheme again next year." The Rural Apprentice competition will be run again in the NFYFC 2010/11 competitions year and anyone who would like to get involved is asked to contact Andrew Wood on 01535 640176 or Andrew.Wood@suerydercare.org. The Prince’s Countryside Fund is a unique collaboration of brands and businesses working together to secure a sustainable future for British agriculture and the wider rural economy. The fund is now accepting applications for grants for projects that are helping to secure a sustainable future for the British Countryside and rural communities. Find out more online at www.princescountrysidefund.org.uk. or download he newsletter.. Check out the NFYFC funding page for more potential sources of funding for your YFC. Don't miss the final opportunity to book onto the Snowploughing Event 2011. More than 500 YFC members and friends will be hitting the slopes at Val D'Isere, France, between 1-9 January 2011. The total cost is £399 including transport, accommodation and ski pass. Beginners and advanced lessons are available. If you require any further information email snowploughing@yahoo.co.uk or phone 07779572598 or visit www.snowploughing.co.uk. BOOKING CLOSES 5 NOVEMBER 2010.